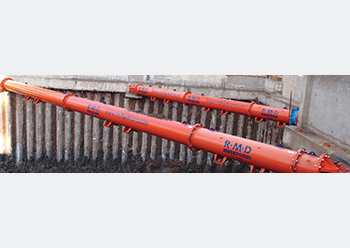 RMD Kwikform’s Tubeshor 610 hybrid hydraulic tubular shoring system. In a bid to deliver complete end-to-end offerings to its customers, RMD Kwikform has launched its new range of ground shoring products into the Mena and India markets. As groundworks projects increase, demand for safe, simple and productive solutions from both consultants and contractors has risen, said the global leader in formwork, falsework and ground shoring solutions. In response, RMD Kwikform has continued to add new products to its ground shoring fleet in order to better service its customers; the fleet now boasts a range of trench boxes, manhole boxes and Tubeshor props. According to David White, ground shoring general manager for RMD Kwikform in Mena and India, the company’s range of ground shoring solutions is the most diverse in the marketplace. RMD Kwikform’s new Tubeshor prop (a tubular shoring solution) for example, is suitable for deep excavations, basement propping and cofferdams, and embodies all of the consultant and contractors’ requirements. The Tubeshor prop range is available in three diameters and various lengths. After recognising the challenges faced by contractors and site teams when it came to using equipment, RMD Kwikform ensured the Tubeshor had fewer components and more handling points. It was primarily designed with the ‘user’ in mind, said White. With in-built safety features and the use of hydraulics for preloading, Tubeshor can be installed, moved and dismantled safely, efficiently and in less time than comparable systems. The design process of all RMD Kwikform’s ground shoring range is consistent; all products are built to ensure maximum productivity and a reduction in labour time and, therefore, costs. Not only is improved safety attributed to the design, but to more advanced manufacturing techniques as well, ensuring that each product is stronger and far more durable. All RMD Kwikform products are manufactured to the globally recognised EN1090 standards and it has the only fully CE-marked range in the entire global market, White claimed, adding that the products are also reusable. “With a growing emphasis on lowering the carbon footprint across the Mena and India markets, we’ve ensured our products remain flexible and sustainable to support our customers’ environmental targets,” he added. With an extensive network of branches and teams across the Middle East and India, RMD Kwikform is able to supply products to all regions and deliver that ‘local service’ it is recognised for.